Toyota sells all the trucks it chooses to build with ease. Toyota also doesn't discount much, by contrast to GM and other brands who routinely offer $10K off the truck before negotiations even begin. These things make the 2019 Toyota Tundra unusual, but the TRD Pro trim is in itself a bit of an outlier. It is Toyota's off-road variant meant for serious ground pounding. We didn't fully test the V8-Powered Tundra TRD Pro in the off-road world in which it is intended, but we did find some unusual things we thought readers might like to hear about. The TRD Pro we had featured many accessories. A cargo bed tonneau cover for $1,295 added to the looks and kept our cargo out of sight. It also had a spray-in bed liner for $579. The Tundra also had a nifty bed extender for $320. We kept it flipped around so that it acted as a sort of trunk. That sure made grocery runs a bit easier. Our Tundra had rock rails and also a "predator drop step" for $749. This makes entering and exiting much easier. If you plan to do serious off-roading suspension upgrades are important. The TRD Pro comes with all the kit you will need including Fox Shocks. The Tundra TRD Pro we sampled had a price of $55,106 including destination and delivery. Inside the TRD Pro is HUGE. The back seat has so much room tools and other bulks items fit easily on the floor behind the seat or in the back seats. We found the TRD Pro to be an interesting mix of daily useful and off-road capable. Are Silverado AT4 and Ford Raptor owners going to be jealous? We don't think so. Will Toyota TRD Pro buyers care? Doubtful. 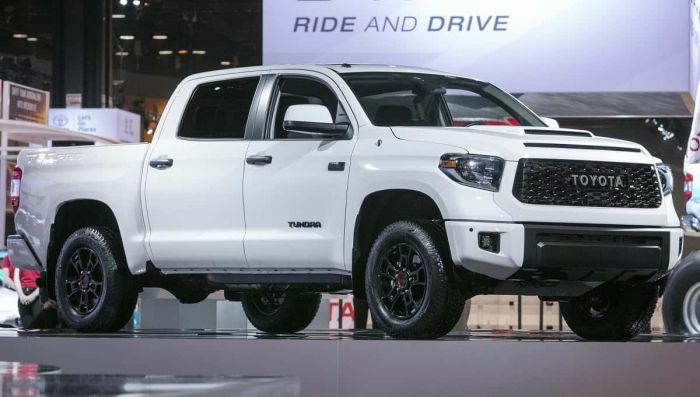 What would you like to see Toyota add to the TRD Pro trim of the Tundra? You got to get a truck with 4 wheel drive not all wheel drive.